The Swedes are also renowned for managing and awarding the Nobel Prize. It is only fitting that the finest Swedish linen graces the table setting spread out on the Nobel Prize dinner hall’s sixty five tables. About four hundred and seventy meters of fine Swedish table linen are required there, including the very best Swedish table runner linens. Certain family concerns have been in the business of producing this fabric on a continual basis since the 17th century. The finest linens are typically woven at old family-owned mills using natural materials that have been cultivated, harvested and selected with an eye toward a tradition of quality and a modern respect for the environment. Table runners exemplify this tradition and can add a festive touch to a holiday table replete with treats and fine dishes, glasses and silverware pieces. 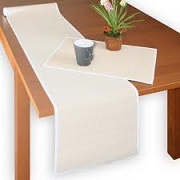 In fact, table runners can add a discreet touch of elegance to almost any table setting. Table runners can grace a bare table for a touch of color along the center. Coordinating place mats can serve a necessary protective function while contributing to the formal beauty that Swedish table runner linens provide grand occasions and intimate family dinners alike. There is nothing at all wrong with placing the ever-versatile table runner on top of a coordinated or nicely contrasting table cloth − for both practical and/or aesthetic reasons. Special occasions and holidays are perfect occasions for unfurling table runner linens that can come in an almost infinite number of patterns and designs. Any seasonal theme can receive a special emphasis if fine Swedish table runner linen is added to the mix. By its very nature a simply patterned table runner makes an excellent complement to other elements that make up your décor. An elaborately patterned tablecloth might just overwhelm every other design element or the pleasure inherent in a display of fine china or table ware. On the other hand, a tastefully designed table runner will fit right in to the mix. Table runner patterns with a welter of pleasing designs are very plentiful. Table runners are rather easy to make and Swedish table runner linens are almost surely some of the finest and most pleasurable fabrics to work with. It may well be time to try your hand at making a table runner yourself. With a fine material like Swedish table runner linen to begin with you may well experience the thrill that countless generations in Sweden have experienced already: making a beautiful and lasting table runner of your own.